What's been a story buried inside Crains and the Tribune business section has now reached the "Diary of the American Dream." Dunno if any readers have a paid subscription to the Wall Street Journal Online, but, if you do, be sure to read the Heard on the Street column today. It seems that some major stockholders want the Trib to sell assets, including the Chicago Cubs, to help solve some of their financial issues. Denis FitzSimmons says he wants the company to "operate their way" out of their problems, meaning he doesn't want to sell anything. Well, with the stock now under $28, pretty soon Mr. FitzSimmons is going to have to start heeding what his stockholders tell him to do (after all, they do own the company) or he's going to need to refresh his resume. (since) the Cubs might consider bringing lefty Sean Marshall north with the club as the fourth starter and send Jerome Williams to Iowa. If that's the case, the I-Cubs pitching rotation in late-April and early-May could include Wood, Prior, Jerome, Wade Miller, and Rich Hill. Won't it be nice to see Jim Hendry's dream rotation all pitching together? In the Pacific Coast League? Neifi Perez knocked in (a) runner to forge a 4-4 tie, and that's how the Cactus League game ended after Henry Blanco and Michael Restovich failed to drive in pinch runner Ronny Cedeno from third. The Cubs were chagrined to see the Sox refuse to go to the 10th in front of a HoHoKam record crowd of 12,894, claiming no pitchers were available. "You hate to see it end in a tie," Baker said. Privately, the Cubs were a little peeved. How can the Sox pitch starter Mark Buehrle for seven innings and not have enough pitchers to go into the 10th after using only three pitchers the whole game? That's what players and coaches were asking in the Cubs' clubhouse. They saw other Sox pitchers in the bullpen and wanted the game to continue at least another inning. Well, here's a hint. Don't want the game to end in a tie? DRIVE THE RUNNER IN FROM THIRD WITH LESS THAN TWO OUTS!!! All last year they left men on the basepaths like home plate was infected with Bird Flu and now they are angry that the White Sox don't want to play extra innings? This team is going to make intelligent fans disgusted if they continue to follow the Dusty Baker / "It's Not Your Fault" line of thinking. This not Good Will Hunting and the Cubs can't blame the abuse they get on an alcoholic father. In fact, the alcohol flow at Wrigley is a big part of the reason the Cubs get so much love. P.S. Now that Japan is the champs of the World Baseball Classic, the White Sox cannot be the World Champs anymore. Only the World Series Champs. At least, that's what I see written in some of the papers these days. While the trip to New Yawk went off without a hitch (as did the bar mitzvah boy's voice), there continues to be plenty of hitches in Arizona. It's really been a boring spring. Other than Mark Prior's shoulder, which those of us that know how to read Cubsspeak knew was bad a month ago, there really hasn't been much to talk about. This spring has really answered no questions that need to be answered, the primary of which is: Who starts until Prior and Wood come back? It also hasn't answered lingering questions about Juan Pierre's off year last year, who bats second, does Neifi get the season killing 350 at bats, does Derrek Lee get a contract extension, does Dusty Baker, does Jim Hendry? All that seems to have been produced this spring is nice, ok, amazing numbers by Aramis Ramirez and a nice spring from Jacque Jones. It remains to be seen if Jones can keep this up. Sean Marshall has been a pleasant surprise. It would be nice for a Cub prospect to contribute above expectations once the season starts. Perhaps Sean can be the guy. Well, at least we only have a week of waiting for the season to start. And the media will be preoccupied with George Mason until then. Here's hoping for some news beyond Mark Prior long tossing 50 feet (not even mound-to-plate distance). This will probably be the last post here for a few days. The family is traveling to New York for a family event. 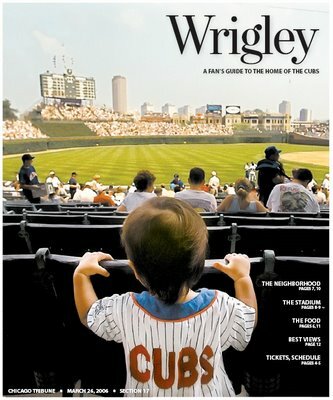 The Sunday, March 26 edition of the Chicago Tribune will include a special insert just for Cubs fans: "Wrigley: A Fan's Guide to the Home of the Cubs." This survival guide will help prep anyone planning to visit Wrigley Field after the Cubs' home opener on Friday, April 7. Also, this site was invited to interview Chicago Tribune sports editor Dan McGrath and other members of the sports staff. I can't imagine what I'd ask Phil Rogers. What's so fascinating about this is something I've suspected for quite a while. The Tribune is aware of, and reads Cubs blogs regularly. They use blogs as a way to measure the pulse of their most passionate fans. That means, if you think we blogs can have an effect on Cub actions and direction of the franchise, you've just been proven right. That also means we in the online community have a responsibility not to simply accept garbage laid out for us by being patient and keeping the faith. They know what we are saying. Make sure they know we aren't a bunch of lemmings. We deserve to be treated with respect and treated with intelligence. Enjoy the read on Sunday. My paper will be on vacation. Guess I won't be reading it! Barry Rozner went the other way on the Cubs-for-sale story. He listed a bunch of potential buyers for the team. With the Trib stock sprialing down (now close to 28), and the main stream press now talking actively about a sale, you'd have to think the chances of this happening continue to improve. Good times are a comin'! "If you had Wood, Prior and Miller all on the DL, who wouldn't be concerned?" Hendry asked. "Two of the three (Wood and Miller), we knew exactly what we were getting into. I'm much more pleased than I ever thought I would be with how they are throwing the ball." So, according to Hendry, the Cubs brass knew that Wood was going to start the season on the DL. If you interpret, "we knew exactly what we were getting into," that most likely means the knew Wood was headed to the DL to start the season when he had his shoulder surgery. That's the only logical interpretation given it was said regarding both Wood AND Wade Miller. Miller was a lock to start on the DL from the day they signed him. That means that they knew Wood was a lock to start the season on the DL, too. If Wood does need the cleanup surgery after the season, he would be ready for spring training, trainer Mark O'Neal said. Looks to me like Jim Hendry has just been caught in a bold faced lie. We fans deserve better treatment than this. Going into the voting booth today, I was struck by a few things. First, the new touch screen voting machines were there. I tried it. Worked pretty well, I guess. Second, I didn’t see my name on the ballot. Ah well. Once every four years is often enough. But I was also struck by a strange thought. There were two primary races I really wanted to vote in: Democratic Cook County President and Republican Governor. Unfortunately, I could only vote in one of those races. Since Blagojevich is a likely shoe-in for re-election, I chose the Dem ballot and voted in the Cook County race. It then occurred to me that limiting a voter to a single party vote is a pretty stupid choice on the part of the parties. There's nothing unethical about voting in two primaries. There’s no violation of "one-man-one-vote" as no office is being filled by this vote. Why should one party care if I vote in the another party's primary? Isn't the first party interested in what I think of their candidates? Because I have an interest in Forrest Claypool vs. John Stroger, the GOP doesn’t care about me? Why do we even have public primaries? The whole purpose of the primary is to select a party's candidate for the general election, right? The parties can't do that by themselves? Why not go back to the smoke filled rooms and have desk-pounding bureaucrats make the candidate selections? It might work out better this way. We might have been spared having people like Mike Dukakis run for national office. Also, we're paying for these primaries out of our own pockets even though the vast majority of us aren't members of the DNC and the GOP. Remember, a primary election is public (read: taxpayer) subsidization of the candidate selection process and only benefits two parties. Well, if I'm paying for it, I want a say in the selection process of EVERY party I'm footing the bill for. Besides, the GOP and DNC have huge sources of cash. Either give me multiple ballots or let the parties pay for their own primaries and leave my taxes alone. And allowing people to vote in multiple primaries might improve our final choice in candidates. If everyone had a choice in both parties' selection process, wouldn't that tend to get more moderate candidates and fewer fringe candidates nominated? Wouldn't such candidates better represent their constituents? Then again, the status quo serves the GOP and DNC quite well. And, I'll bet, the incumbents. That means I probably wasted my votes this morning. The Big Ten really just wanted to make Billy Packer look stupid, right? Not that they just stunk up the joint worse than a skunk living in a Diaper Genie. Iowa led the shlock attach by blowing a 17 point lead in eight minutes. With any luck, the IU Board still wants Steve Alford. I mean, he now has screwed up a 3-14 game as bad as Bobby Knight ever did. All that's missing is three titles and some harassment issues. So, on Friday, the Trib stock tanked $1.41 falling to an approximate 8 year low. The next day, the Tribune not only acknowledged the rumors the Cubs are for sale, but addressed them head on. In response to renewed speculation this week that Tribune may look to sell its high-profile asset, the Chicago Cubs, the company said Friday it was not parting with the baseball team. "The Cubs are not for sale," said Gary Weitman, a Tribune spokesman. Why should they be for sale? It's not like the Cubs need cash quick and they'd rather have the long term cash flows from the Cubs profits, right? Last autumn, for example, a federal tax court ordered Tribune to pay $1 billion in back taxes and interest after the company lost a tax dispute that it inherited through its acquisition of Times Mirror Co. in 2000. Tribune, which owns the Chicago Tribune, borrowed several hundred million dollars to help pay the tax bill. Moody's said it expects the newspaper industry's fundamentals to remain weak "for the foreseeable future." The debt-rating firm said its review will focus in part on whether Tribune can maintain the financial performance measures appropriate to its current relatively strong A3 debt rating. Moody's also said it was considering reducing the debt rating on Tribune rival New York Times Co.
Dunno how many of you understand what a Moody's downgrade does to a corporation, so I'll explain. When Moody's or any other major credit rating agency (Standard & Poors) changes a debt rating, the interest rate a company has to pay on its debt changes as well. The relationship between interest rate and credit grade is inverse. In other words, a credit downgrade results in an increase in costs to a company. So, here's what we have. Moody's is reviewing the Trib, and not just a normal review, but "review for possible downgrade." This means, unless something changes quickly, the debt is being downgraded. Given industry fundamentals will remain weak for the near term, there's very little to create a fast change in Trib's debt structure. Also, the #4 shareholder, Ariel Capital, wants the Trib to sell the Cubs. Tribune's travails had spawned rumors last autumn that the company might sell the Cubs as a way to raise cash. But the rumors faded over the winter before resurfacing this week. Tribune bought the Cubs in 1981 for $20.5 million. The team's value now has been estimated to be more than $500 million. What do we know about Trib leaks? They always leak their long term plans in the press so as to desensitize an issue. That means the Trib just had their reporter place the price at which they will sell the team in their own paper. Ignore the little spokesman they sent out. That's just S.O.P. Were they to say the Cubs were for sale, that's would be chum for the sharks. The only question left in my mind about the Cubs being sold is tied to the probable downgrade. Will they sell the Cubs before the downgrade in order to pay off $500 million in debt and stave off the downgrade? Or, will they avoid the reduced price a rapid sale would fetch, eat the downgrade, sell the team in 12 to 18 months, and then pay down debt and have the credit agencies re-review? A great day is coming, Cub fans. The Cubs are going to get a new owner. That new owner could be better or worse. But the new owner also offers something currently unavailable. Before we get to the Cubs, Mike Greenberg was shouting on ESPN Radio this morning that yesterday's three losses by Big East teams in the NCAA Tourney are irrelevant to the debate that they either did or did not belong there. While that's true, it misses the point that people are going to make today. That point is: Billy Packer got his foot shoved down his throat and out his duodenum. All Packer's yapping that more power teams belonged in and fewer mid-majors should have been invited is now rendered laughable. Then again, all Packer's yapping is laughable all the time. Now that Mark Prior is out at least the first 7 to 10 days of the regular season, we look to the rotation. And that look reminds us of an old Rodney Dangerfield joke. Rodney goes to his doctor, Dr. Vinnie Boom Botz, and says, "Doc. I wake up every morning and I look in the mirror and I wanna throw up. What's wrong with me?" "I don't know," say Boom Botz, "but your eyesight is perfect." Yes, that's the backbone of a $100 million payroll baseball team. When a fifth starter is needed, they will look to Rich Hill, Sean Marshall, Angel Guzman and Jae Kuk Ryu. Pardon me a moment as I breathe a sigh of relief that my investment portfolio does not include Cub tickets held to be scalped for profit. What's so laughable about this is that it further demonstrates the area of Jim Hendry's incompetence. While I think Jim is a good guy to work out trades, he clearly has blind spots when it comes to creating his roster. He went two straight years (2004 and 2005) without getting a leadoff hitter. He failed to add to his bullpen help when he needed it (2003 and 2004). Now, he's failed to get additional starting pitching help. How does Kevin Millwood in a Cubs uniform look now? Some dopes can argue that Millwood was too expensive. Right. As of right now, instead of spending an extra $12 million on Millwood, the Cubs are blowing a full $100 million on a team headed to 3rd place. As a "sage" said, "It's not the amount spent, it's if you spend it wisely." Knowing that Kerry Wood, Wade Miller and Prior were all doubtful to start the season, spending the $60 million over 5 years on a Millwood would have been wise and prudent. Now, it will may cost Hendry his job. Starting at Noon, Friday in Peoria, Illinois, the IHSA Class AA Boys Basketball Tournament begins. The best matchup of the day is at 6:30 PM and features Glenbrook North and Jon Scheyer (who Village President Gene Marks called GBN's "secret weapon" Tuesday night -- Scheyer's about as secret as Bill Clinton's penchant for women) versus Simeon and their star junior Derrick Rose. You can bet the NCAA Toruney will be off in the Ivy Chat household until 8 PM. I actually like Simeon to take the whole thing. But, GBN has a great shot if they get any sort of lead. They make foul shots like crazy. That's what won them the Super-Section versus Warren (who missed 6 of 12 foul shots in the game). If Zach Kelly can make his foul shots and Scheyer stay in control, GBN could go back to back. Beats watching U Conn and Duke. Yawn. It all goes back to spring training in 2004, when Prior was flown to Chicago to have his elbow examined. Up to that point, the only announced problem Prior and the Cubs revealed was Achilles' tendinitis in his right foot. He denied having any elbow pain a day before he left camp. When the story broke that Prior's elbow had been examined, the Cubs and Prior were forced to reveal the injury. Prior later said he regretted not being more forthcoming about his elbow, but it was too late. When Todd Hollandsworth fouled a ball off his leg later that summer, the Cubs repeatedly said he was a "couple of weeks" away from returning. He never came back that season. If some fans want to choose to believe the Cubs administration that Mark Prior is healthy, they also would believe the administration if they were shown the Cardiff Giant, offered Enron stock, and asked to back Doyle Lonnegan's half a million dollar bet on Lucky Dan to win. Credibility should be earned, not granted. It's about time Cub fans stood for something other than beer, sun, lemming-like ticket buying, and losing. Integrity would be a nice start. In the interest of full disclosure (and possible public ridicule), Ivy Chat hereby publishes all the wrong choices for the 2006 NCAA Tournament. While I do think U Conn will win, I don't really think Iowa makes the round of 8. I do hope (and was so rudely slapped down by TJ yesterday for this idea) that a run to the Elite Eight will be the final event that will trigger the Indiana Board of Regents (or whatever they call it) to hire Steve Alford away from Iowa. It's almost predictable down to the minute. Mark Prior now admits to having a sore shoulder. Prior was playing long toss before a scheduled bullpen session at Cubs camp Tuesday when he complained of discomfort in the posterior of his right shoulder. General manager Jim Hendry said it was the first time this spring that Prior had complained of soreness. No word if he complained about shoulder soreness BEFORE spring. And to all those "completely healthy" statements he made? Easily dismissed as the soreness did not indicate a lack of health, rather just "normal" soreness. It's very clear that Prior is in pain and has been in pain for several weeks. That's why he hasn't been throwing very much. Dusty and Rothschild clearly wanted to stretch out his arm without aggravating the injury. Well, it's not like Cubs fans are fooled by this crap. It's not like they lemmingly snapped up a record number of tickets. My money says Prior does a replay of last year. A DL stint to start the season and at least 1 turn skipped in the rotation. Noticed this tidbit in last week's Crain's Chicago Business. 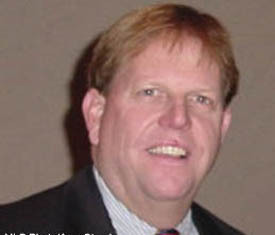 In a section about stock tips, one John Rogers Jr., CEO Ariel Capital was quoted. His pick? Tribune Corporation. "Selling (the Cubs and their Food Network investment) would be the intelligent thing to do. It's time for them to focus on what they do best." Why should they do this? Simple. Neither is vital to their future operations. Now, before you dismiss Mr. Rogers as just some stock analyst, please note Mr. Rogers' job. Ariel Capital isn't just some investment house. They own 10,137,623 shares of Trib stock as of December 31, 2005. That makes them the Tribune's 5th largest shareholder; 4th if you exclude the Robert R. McCormick Tribune Foundation. You think this guy might have some influence on the future of the Trib? Antwaan Randle El has signed with the Redskins. It seems 6 years and $18 million with $8 million up front wasn't enough to get Randle El to play in his home town for a team nearly a lock for their division title with a Superbowl caliber defense. Makes you so proud that the City of Chicago gave Mike McCaskey $450 million to give us continued disappointment. You'd think people have better things to do with their time than visit this this site of tripe. Well, unless skimming for Lindsay Lohan and Elish Cuthbert pics offsets that. Kudos to TJ for predicting Glenbrook North vs. Warren. See you Tuesday at Rosemont! Steroids are NOT illegal. They can only be illegally OBTAINED by a player or illegally SMUGGLED over international borders. When Bonds started taking the Cream, the Clear and the Clomid, HE WAS NOT BREAKING ANY BASEBALL RULES NOR WAS HE BREAKING ANY LAWS. The idea that steroids are "illegal" is a meme that needs to stop. "Everybody knows Todd (Walker) can hit, but I have to keep an eye on him because you don't want him to have anything go wrong with that leg physically after what happened last year." ...Dusty was sabotaging Jim Hendry's ability to trade Walker. Way to go, Dusty. You can't manage very well, and you can't generally manage very well. While you do seem to collect your salary very well, you do a poor job paying your taxes. But, on the flip side, Bernstein and Mike Murphy tried to start another meme. That Barry Bonds use of drugs were costing other major leaguers money. The idea is that because Barry got $17mm, the Randy Winn's of the world got less. This is senseless. Randy Winn gets MORE money because of Bonds and Sosa and McGwire. Because those guys were a draw, the attendance and TV ratings went up. That meant more revenue for the teams and more dollars to give Randy Winn a higher salary. The reason players don't complain about juiced teammates is that the non-juiced players also benefit financially. Dusty Baker may not realize it, but the impetus for his departure from the Cubs may have accelerated yesterday with the release of Game of Shadows. Why? There's nothing the Trib wants more than a clean image of the Cubs. And it's hard to see how Dusty Baker walks away unscathed from this, regardless if he had the power (or inclination) to prevent Barry Bonds' steroid use. This becomes especially clear when you hear what Dusty actually said. "I'm not aware of the book, but I'm aware of part of it. I was made aware of what was written in the Sports Illustrated part. I don't know how much is in there. I read that part." It's cool to be unaware of something of which you've already read parts. "I was quite surprised with the detail that was in there. I don't really have any new light to shed on the situation." Translation: Boy, were they accurate. So accurate I can't add anything else. "I wasn't aware of (Greg Anderson dispensing drugs to Barry Bonds) because I don't condone the use of steroids. I've got a little boy 7 years old, and I want to protect him and all kids." "I didn't even know there were that many kinds of steroids. I've never even seen steroids. I didn't even know what kind of steroids are steroids other than the kinds you use to fight allergies. You have to be a doctor to keep up with all that stuff." Translation: I'm not a doctor, so how could I be expected to know if it was the Cream or Noxzema? "I didn't have any clue. I thought he was Barry's weight trainer. He was given the OK from upstairs. What are you going to do when he was given the OK from upstairs?" Now we see why Dusty was allowed to leave San Francisco without a fight. Peter Magowan just was thrown under the bus (namelessly). And we also see why Ned Colletti had no interest in hiring Baker away from the Cubs. "Everybody saw the physical change. You didn't know if Barry was lifting weights because he lifts all the time. It says I wasn't interested. What are you going to do? I'm not a detective. What are you going to do as a manager? How can anybody assert that I wasn't interested?" If you don't bother to try to find out why one of your players has added 40 pounds of muscle weight, it's easy to assert you weren't interested. And, while Dusty is not a detective, he have to be a clueless imbecile not to at least ask the trainer, who had free access to the clubhouse, how the change was accomplished. Wouldn't a good team leader also see the improvement in Bonds' game and ask said trainer if the same improvements could be made to the rest of the team? You would, unless, of course, you knew HOW that change was being accomplsied. "I've been against steroids ever since my friend, Lyle Alzado, died. It can't be good. There's no way it can be good. It's not good for our country. It's not good for the game." So, a close friend dies from the stuff. You would think that would make you aware of how steroids change your body. You see changes in one of the players under your care. You ask nothing. Can anyone say "plausible deniability"? "Had I known, oh, definitely, I would have said something (to Bonds). But I didn't know. Everybody was speculating about a lot of people." Check. Because speculation was rampant, you didn't take the opportunity to warn Barry proactively about the danger. Well, what do we expect from a guy who can't teach baseball players until he sees what they can already do. And THEN says the players are already set in their ways and his teaching would be futile. Alas, the worst part of this story comes not from Bonds, but from Derrek Lee. "When does it stop?" Cubs first baseman Derrek Lee said to the Los Angeles Times. "They've been alleging this forever. He hasn't been caught, so leave him alone." Why is Derrek covering for Bonds? He covered, wrongly, for LaTroy Hawkins being booed last year. Now, Bonds. Here's some advice, Derrek. Shut up. Barry Bonds is bad for baseball. On a number of levels. Don't be defending him. At best, you look like an idiot. At worst, someone could accuse you of needing cover for yourself. The world is shocked, just shocked that there is gambling going on are steroids in Barry Bonds. What no one is talking about is the fertility drug that Barry was taking: Clomid. ...you have trying to build teams to win a division. If you're the St. Louis Cardinals, building your team to try to beat the Cubs, you might spend more money if the Cubs have Mark Prior than if they don't. It's to Chicago's advantage to get the Cardinals to spend more now so they have less maneuvering room come the trading deadline. They want the all the teams in the division to think Prior is healthy, so they waste resources preparing for that possibility. That's just silly. The Cardinals and Astros are not waiting to make personnel decisions based upon the health of one pitcher on one of their divisional opponents. Walt Jocketty isn't sitting around saying, "Well, maybe we should trade for Miguel Tejada. What? Prior's hurt? Cool. Cancel the Tejada deal." The Cards are trying to put the best team together of the players available to them. Additionally, other teams aren't going to fall for media releases on the health of opponents' players. They are going to do their own scouting and make their own conclusions. So don't be too tough on the Cubs management. They want to sell tickets. Hiding injuries to assist in selling tickets? What Pinto is actually saying (if he realizes it or not) is that the Cubs are actively perpetrating a fraud on their fan base. Now, that might be possible, but even this site is not so jaded as to believe that is their actual intention. Keep it as quiet as possible until the player goes on the DL. Kirby Puckett may not have been the best father and husband. But he was a hell of a ballplayer. May he find some peace. Back in 2004, the Cubs slowly leaked information that Mark Prior was hurt. What was going to be a few missed days from an Achilles problem stretched into 2 months with an elbow problem. The Cubs were not honest with their fans. You'd think they have enough respect for us now that they wouldn't try that again. Since very little about the Cubs' pitching picture has been conventional the past few springs, manager Dusty Baker left open the possibility that both Rusch and Williams could be in there. "You don't know what could transpire before (the start of the season)," Baker said Friday. "You might need both (Willaims and Rusch). Some of it depends on the progress and health of some of the other guys." Baker repeated his belief that Prior would be ready to open the season as scheduled, but he left open all possibilities. "They're a lock," Baker said of Zambrano, Prior and Maddux being his top three to start the season. "But we've got to get Prior to that point first. He's on schedule to do that, but until we actually get out there, you don't know what could happen to somebody. "There are no locks when you play competitive games. You don't know if somebody is going to come up sore. You don't know if somebody's going to pull something or whatever. Yeah, I expect it (Prior to open the season in the rotation), but you donÂt really know. I hope everything works out great." Notice Dusty trying to set expectations that "somebody" (read: Prior) could get hurt in camp. This way, there's no shock when it's finally announced that Prior is hurt. I'll make a similar prediction like I made a few years back. If Prior doesn't throw in a game by the second time through the spring rotation, he's a lock for the DL to start the season. This is a near dead repeat of what they did two years ago. I am soooooo glad I cancelled my season tickets years ago. To think of actually, directly, financing Andy MacPhail, Jim Hendry, and Dusty Baker's compensation makes my stomach hurt. WSCR is reporting that Kerry Wood will have arthroscopic surgery on one of his knees (does it really matter which at this point?). I'm sure this is a sudden onset problem and not something the Cubs and their (on) crack medical team has been aware of for weeks. The Cubs estimate that Kerry will be out only a few weeks. What's unsaid is that those weeks are comprised of days as long as the days in Genesis I. On the bright side, the payee of the steak bet seems to be locked in. "That could change, but hopefully it doesn't have to," Rothschild said. "I want to see how he is [before then] after loading him down with this kind of throwing." Whew! This is good news. I was afraid Prior was hurt or something. It looks like a ton of Major League Baseball's big name stars are going to sit out the World Baseball Classic (aka the WBC or the Worthless Budselig Charade). They realize that being healthy in September is more important than playing in meaningless exhibition games that only exist to try to promote the game internationally. Meaningless games? Yes. Baseball is trying a drummed up international competition to drum up international interest in their game. This is not a new idea. In fact, the three other major sports have all tried this, and two of them have failed. While the NFL's foreign exhibition games and NFL Europe have met a modicum of success, the NBA and NHL's participation in international events has ended up being an unmitigated disaster. Beyond the original NBA Barcelona Dream Team back in 1992, professional league's participation in the Olympics and other formal international competitions has only succeeded in shedding a negative light on the leagues themselves. It's gotten so bad that the NHL is considering pulling out of Olympic participation as soon as the 2010 games are over. See, what the NBA and NHL thought, and baseball still thinks, is that if you put your big stars on stage for the world to see, the world will flock to your sport. That means ticket sales, jersey sales, and (the big one) TV broadcast right sales. Why limit your market to 300 million Americans when there are five billion people in the world? The mistake MLB is making is failing to learn what the NBA and the NHL recently figured out: Good games sell themselves. Having compelling star athletes perform on the international stage does nothing if the stars don't perform above expectations. That means crush every other country's team. Look at the bloodbath USA Hockey is taking given their recent performance in Turin. Remember when NBA players lost to Puerto Rico? What's a paying fan supposed to think? If these players are the best in the world and play for a world title every year, why can't they beat Puerto Rico? Or Sweden? Or Latvia? The NFL understands this. They've limited their international exposure to simply changing the venues of games already scheduled and a minor league. Their stars are not expected to perform on the international stage any differently than they would on the domestic stage. MLB should not force this farce upon the fans and embarrassing itself in the international community with slaughter rules, pitch counts and high profile player defections. They should not jeopardize the health of key players and possibly alienate existing fan bases. What they should do is promote a real international tournament. Get the most talented minor league players, college players and international prospects to suit up. Get the Japanese league to contribute players and capital. Same with the Korean and the Italian leagues. Make the WBC a showcase for BASEBALL, not Major League Baseball. If the tourney were successful, the trickle down of interest generated would instead trickle up to MLB. "You loved the WBC. Now see the game played at the highest level. MLB Fever – Catch it!" I remember after the 1980 Miracle on Ice and the 1992 Winter Olympics I wanted to see what happened to those players. Did Ray LeBlanc ever succeed at the next level? Did Jim Craig translate his brilliance to the NHL? Hell. Even the 1988 USA Olympic Baseball team got me interested in following the careers of Andy Benes, Ben McDonald, Robin Ventura, Ty Griffin (ok, what I followed of him, I hated), Scott Servais and Micky Morandini. Stop the foolishness. Baseball sells as a game by itself. It's too bad Selig thinks he needs to drip celebrity on the world to generate interest. Perhaps there's no worse indictment of Selig as a leader of baseball than that. He simply doesn't trust the game to be exciting to the world. Yeah, that’s a guy you want selling your wares. With the three main local papers (Tribune, Sun Times, Daily Herald) having their reporters crawling all over the spring camps, you would think they could come up with a range of stories. Despite the manpower and the number of athletes, coaches and executives available as story fodder, the three papers are only able to come up with the same story each day (today would be Dusty Baker's reaction to the current Frank Thomas and Kenny Williams love fest. So, with no news coming out of camps (a refreshing change), we look locally for a story. Last night, Glenbrook North started their Class AA basketball title defense with a 46-32 win over Lake Zurich. Jon Scheyer was held to 7 points on one field goal and 5 of 7 foul shots. Good job by the rest of the team to pick up the slack. Scheyer suggested that Lake Zurich was more interested in keeping his numbers down than winning the game. Well, let the rest of the state know that Zach Kelly and Tyler Cullitan are up to the challenge. Up next, the winner of Jacobs versus Barrington. If they move on again, the bracket has them likely playing Stevenson, Palatine or Hersey.